Regular exfoliation of dead skin from your body will keep your skin looking vibrant, restoring glow and brightening dull skin. COCOLAB's Venderfields Body Scrub is a luxurious scrub that uses walnut shell and brown sugar as exfoliating granules to gently slough off dead skin. 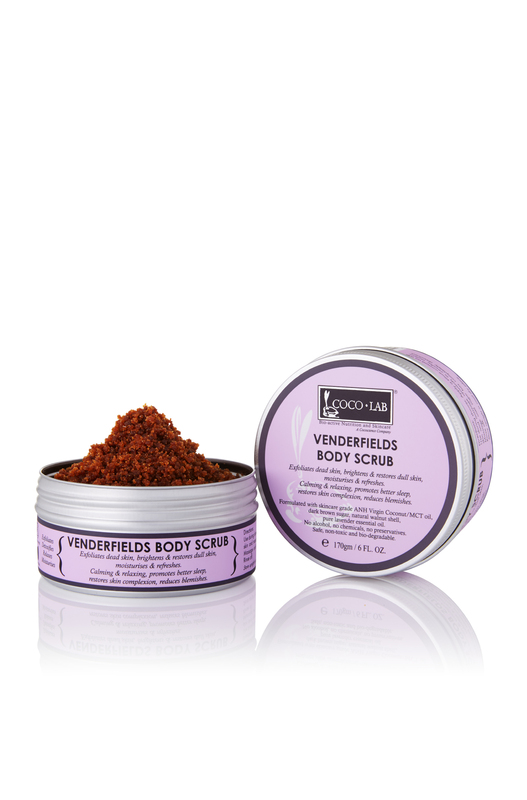 Restore uneven skin complexion and reduce skin blemishes with the Venderfields Body Scrub, with natural botanical extracts. Formulated with skincare grade ANH-VCO, this luxurious body scrub has anti-bacterial and anti-fungal properties to kill bacteria and protect your body. This premium scrub moisturises even as it rids the skin of dead skin cells. A 100% natural and gentle body scrub that is safe on all skin types including children's skin. Comes in a relaxing blend of lavender oils for a perfect spa finish. Perfect for those looking to revive a healthy glow to their skin. Suitable for all ages. This synergistic formulation cleans, protects as it moisturises. INGREDIENTS: Caprylic/capric triglyceride, Absolute No Heat Virgin Coconut Oil, lavandula oil, muscovado dark brown sugar, juglans regia (walnut shell). Use during shower. Apply a small amount on wet skin and massage upwards in circular motion. Massage until sugar has completely dissolved. Rinse off. Use 2 to 3 times a week.